This is a relaxed part of the world. There is no rushing, pushing or long take away queues. We’re on Abercrombie Street in Darlington and the lack of uni students streaming by means it’s a weekend. 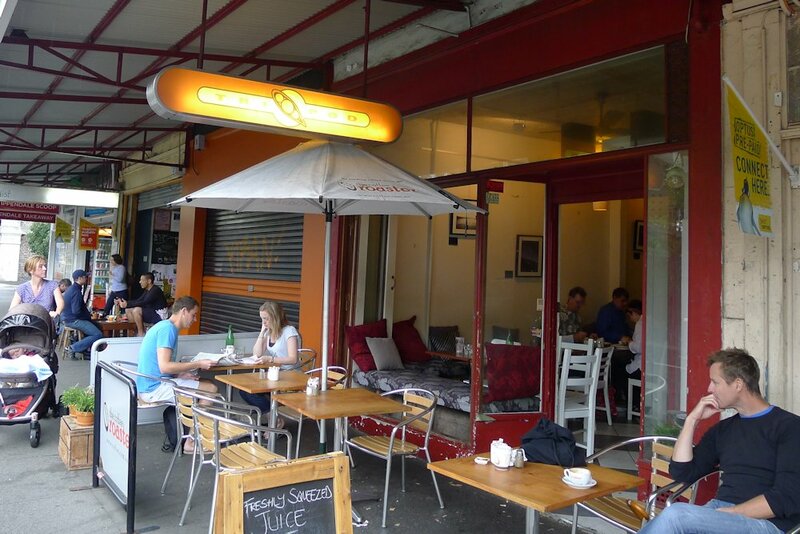 There are a few great cafés on this strip including Café Ella and The Shortlist Espresso Bar. We look around at our neighbour’s dishes and know we’re in for a treat! First up we try a juice called Immunity (orange, ginger, lemon, mint, $5). It tastes very refreshing and is recommend if you have a bit of a sniffle or sore throat. 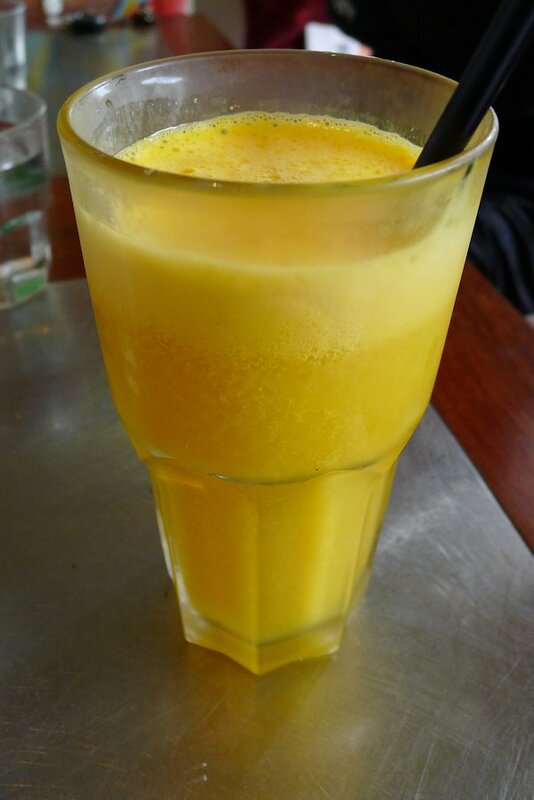 Other freshly squeezed juices include the Energise (pineapple, apple, ginger, mint) and Liver Clense (carrot, celery, apple). If none of those tickle your fancy, mix your own from the following: orange, pineapple, apple, carrot, celery, beetroot, ginger, mint, and lemon. 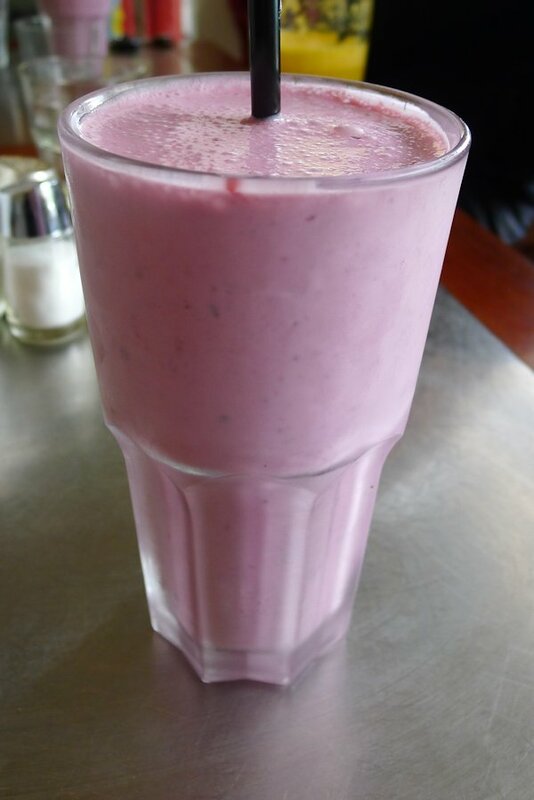 Smoothies ($5.50) are also available and include banana, mixed berry or mango. We enjoy the mixed berry version which is full of not only berries, but other flavours as well thanks to the yoghurt, ice cream and honey. 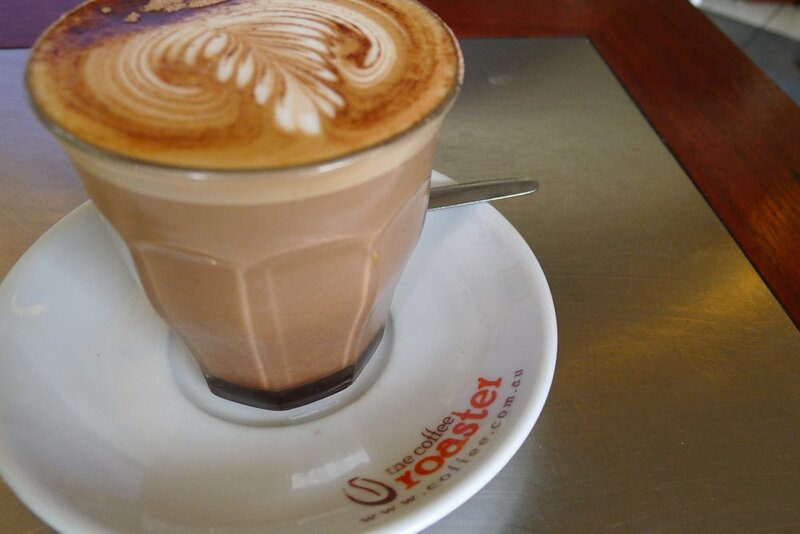 This week Tripod are using a Kenyan coffee ($3 regular, $3.50 large, $4 jumbo). The menu says “the coffee we use has been certified organic and fair trade and is sourced from Guatemala and Ethiopia and roasted locally in Alexandria by The Coffee Roaster”. 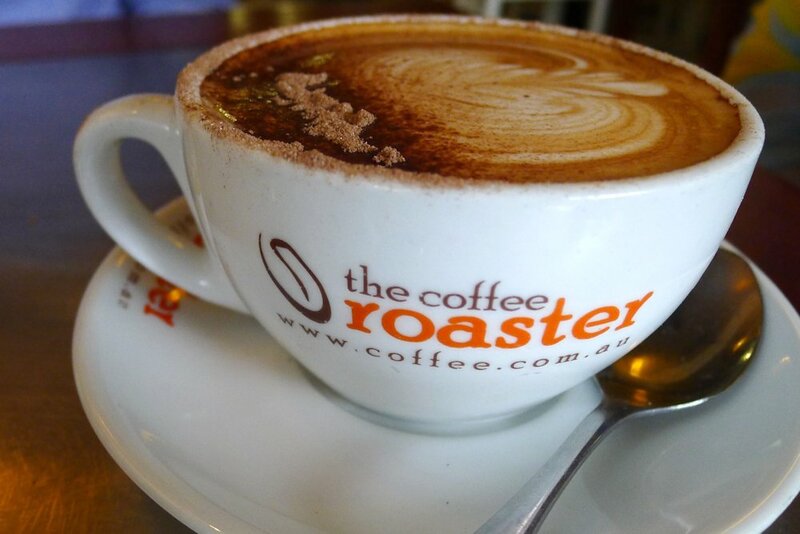 We’re happy to be drinking ethical coffee and it tastes great. 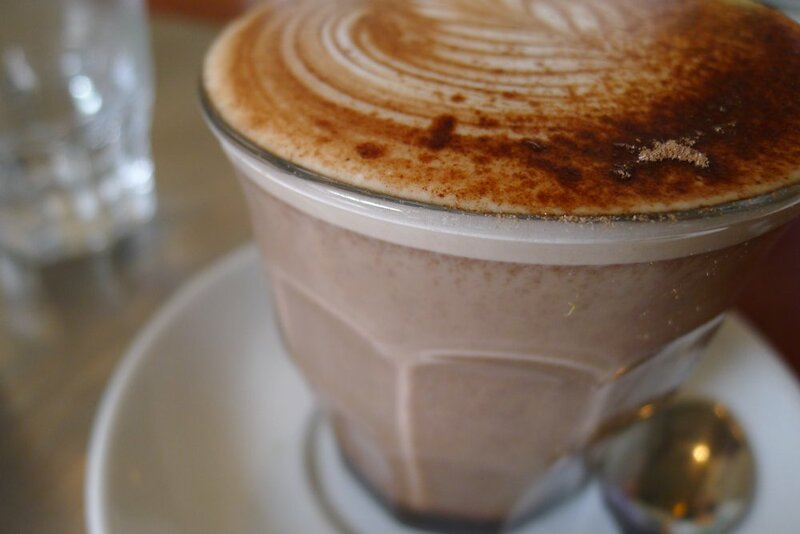 The hot chocolate (reg $3, large $3.50, jumbo $4) is elegantly presented and tastes special. It leaves our guest wanting another. 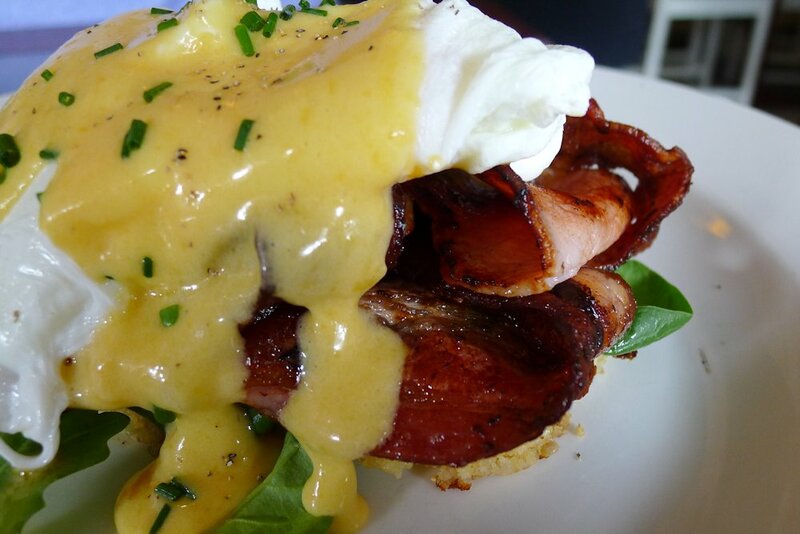 The quinoa cakes egg benedict ($11) comes with baby spinach and verjuice hollandaise and is also available with caramelised honeyed ham or bacon ($13) or Tasmanian smoked salmon ($13). This is a gluten friendly dish and verjuice (as the menu explains) is made from the juice of unripe grapes which have a slightly acidic flavour. The taste is definitely discernible from other hollandaise sauces we have tried and the quinoa cakes are very enjoyable although we understand for some the flavour may be an acquired taste. 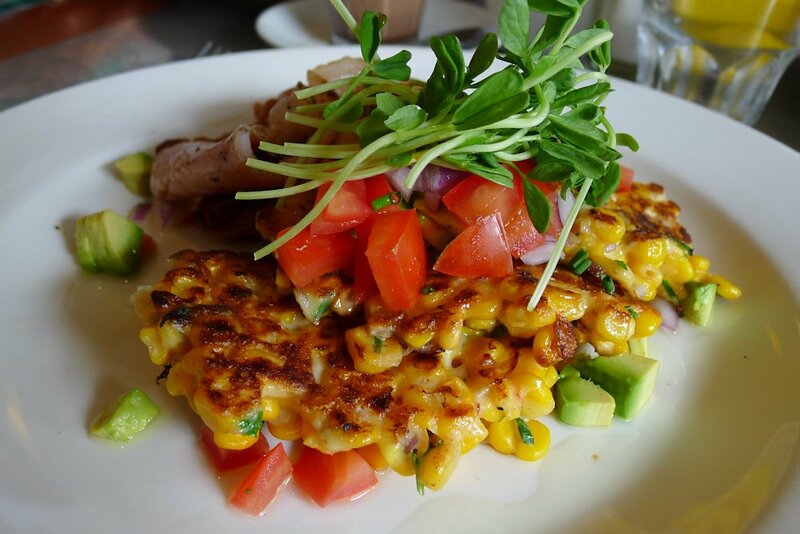 The sweet corn fritters ($12) are served atop fresh avocado and Tripod tomato relish. We were expecting more of a sauce as opposed to pieces of tomato but overall the flavours are very satisfying. It’s easy to see and taste that all of the ingredients are fresh and of high quality. Looking at the above photo, we certainly don’t need to mention the fact that there was plenty of corn do we? We requested crispy bacon ($3) on the side too. As with the other dishes, the serving size compared to the price is fantastic. 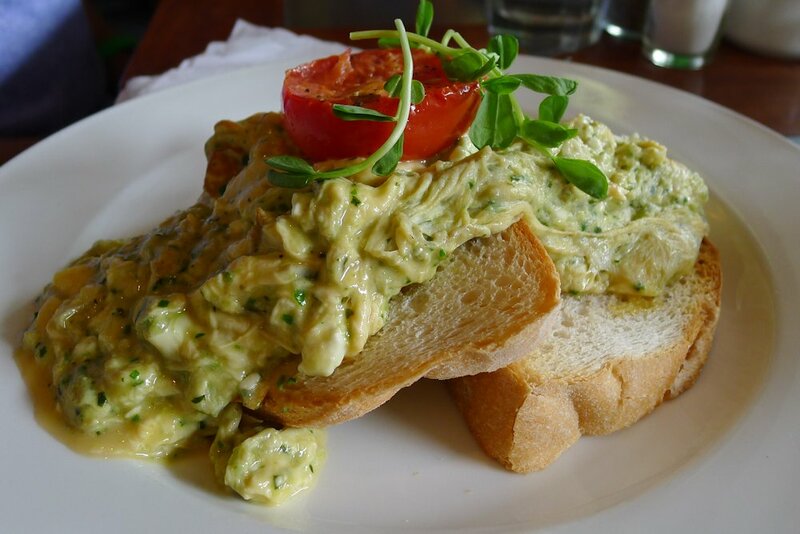 One of our guests order the Tripod scrambled pesto eggs ($12) think that if it is named after the café, it must be worth something! She is right – a fresh and strong flavoured homemade rocket pesto is mixed throughout and there is also no shortage of fetta. The toast has the right amount of crunch and this quickly becomes a sort-after dish at our table. 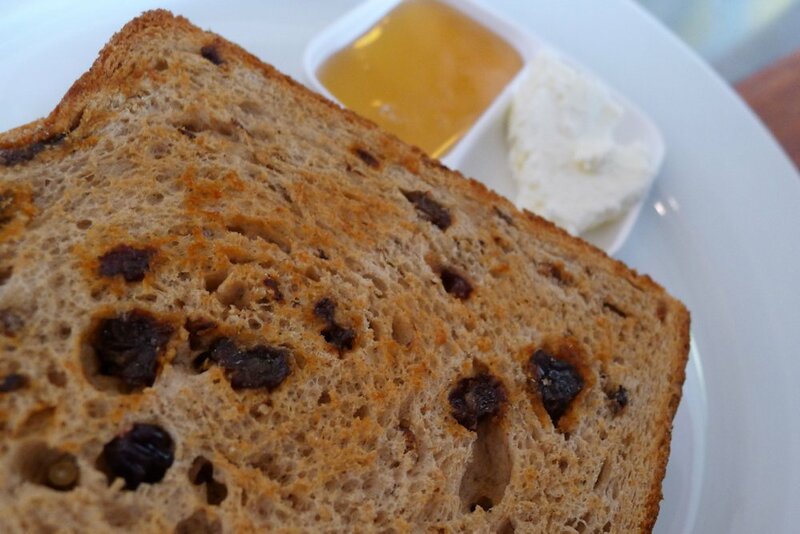 The raisin toast with fresh ricotta and honey ($5) arrives only slightly warm however the spices are quite aromatic. The honey and ricotta are a nice change to plain butter and we enjoy the toast as a light (and inexpensive) alternative to eggs. 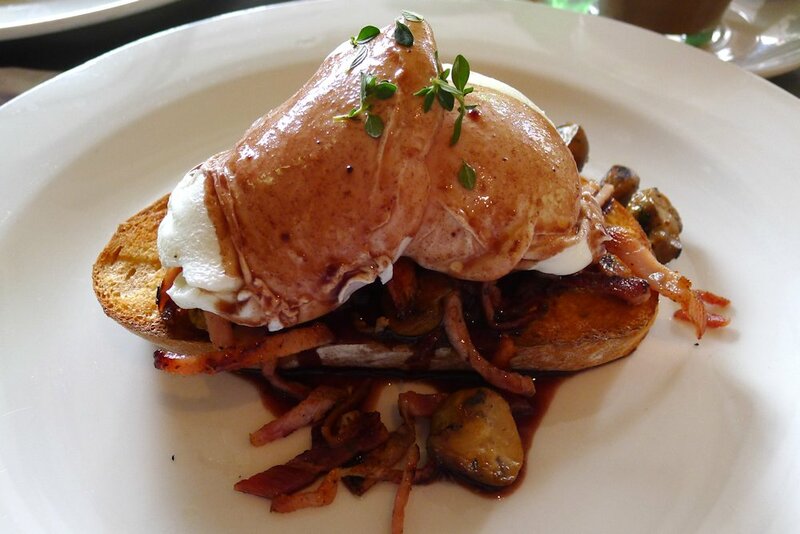 Oeufs en meurett ($14) literally translates as “eggs in red wine sauce” and that is exactly what our guest receives! This is another Tripod dish that (for the Sydney café scene at least) is unique. The eggs are poached perfectly and the sauce is a nice alternative to the usual morning fare. The thyme-infused infused mushrooms are plentiful and complimented well by the crispy bacon. 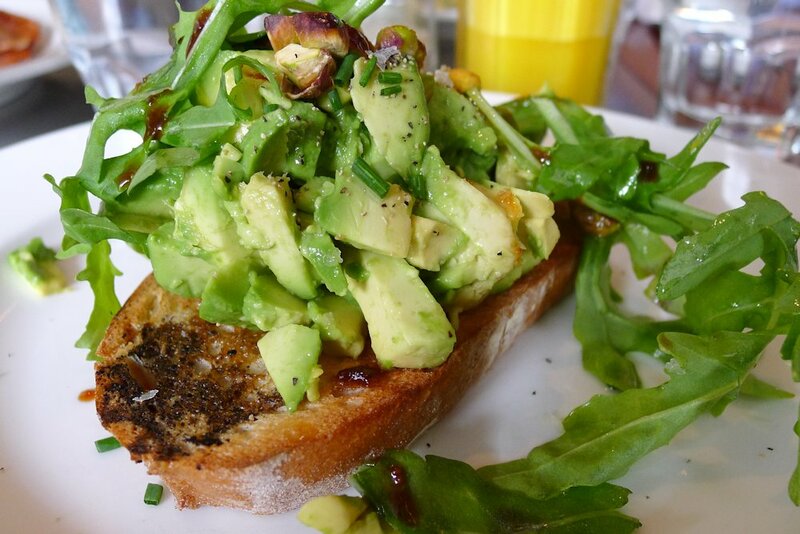 The avocado and crushed pistachio toast ($9) with arugula, shaved parmesan and fig vino cotto is delicious. We love eating avocado on toast however this is a delicious extension to a favourite. The pistachios add texture to the avocado and the salt and fig vino cotto balance each other well. Overall a very delicious meal! Other dishes on our to eat list are: French toast with berry compote, fresh ricotta and shaved almonds ($12), Tripod beans on toast with chorizo and chives ($9) and the Tipod big brekky (eggs of your choice, bacon chipolata sausages, sautéed mushrooms, rosemary fried potatoes, roast tomato, toast, $16). We observed other patrons eating some of these and once again we found the prices to be fantastic at Tripod. If you visit Tripod on a Saturday be sure to check out the Eveleigh Markets in the Carrigeworks. There is also a little community garden called Charlie’s Garden which is worth a look. Tripod also have a new website which has lots of great information. Let us know if you like Tripod as much as us! This entry was posted in Sydney - South and tagged Dog friendly, Gluten free options, Organic Options, Outdoor seating, Reasonable prices. Bookmark the permalink.